Interior design has historically been a costly, time-intensive process that involved collaborating with an designer to envision, plan, and create a space that is not only aesthetically pleasing to the customer, but functional as well. The interior designer had to put in mounds of effort and energy to understand to their clients lifestyles in order to create the desired mood and feel, then reach out to trusted artisans, vendors, and others that could help execute the design. Even with a clear vision of the home of one's dreams, the average customer often faces difficulty articulating that vision into words. It's the designer's role to help bring the client's vision to life, and while that often works out, there's never a guarantee that the end result looks like what was expected. Traditional interior design companies have operated successfully for a while but have declined to deliver meaningful innovation or undergo digital transformation. Aware of a space that lacks innovation, several platform businesses have emerged with solutions for disrupting this staid industry. While late to the party of industries that have been significantly disrupted by technology, interior design is finally turning a new page. The traditional in-person client-designer relationship is no longer the leading industry norm. Innovative platforms that use technology to execute interior design are elevating the process without depriving the individuals of any sought-after personal touches. These interior design startups help solve the fundamental problem with the interior design industry: a lack of efficiency and convenience. Their approaches require no in-person visits and clients can work with designers located anywhere around the world. Startups such as Houzz, Homepolish, and Hutch are evolving interior design so that it is quicker, more affordable, and more convenient for customers. Users can now design their various spaces up to eight times faster! Houzz helps users discover design ideas, select the ones they want, and then connects them to local professionals to help. It even allows users to purchase good from their curated collection. Homepolish similarly connects users to interior designers, but the key difference is that the designers are freelance contractors. After meeting with the designers and receiving a custom proposal that includes a recap, inspiration for the design, and next step s.
The client is then recommended to buy a certain number of hours to be used over as many days as and at any time desired. This amount of control over pricing and time is incredibly remarkable, especially since interior design companies would charge much more, including service fees, commissions, and potentially marked up furnishings. Platforms such as Homepolish and Houzz are putting expert help within everyone's reach at affordable prices. It seems these startups are turning the interior design industry upside down, especially since Houzz was recently valued at $4 billion. New technologies are showing a lot of promise for the future of interior design. It'll certainly involve healthy doses of 3D printing, both augmented (AR) and virtual reality (VR), and smart homes. VR would be ideal for an interior designers as it would allow them to walk their clients through a room they've created, or show them hundreds of different wallpaper designs. The technological future is making VR a reality, however it is still expensive and not feasible for deployment yet. On the other hand, Augmented Reality (AR) has already made its way into the industry. While AR can't stimulate total immersion into a virtual world created by software, it can fuse together the virtual and real world by placing virtual features over the actual ones. Hutch, an LA-based virtual design app, allows users to take a photo of a space and try different products and styles in order to see it virtually decorated. Download the app, snap a photo, let it process the room, then users can swipe through different style categories and essentially drag-and-drop different items to see it in place. After uploading a photo of a room, users are able to choose from a variety of themes like, tribal influence, electric chic, or even Venice boho. With a simple swipe right, they can then see different arrangements of the furniture. The key is that they can see it live, not merely visualize it in their heads. Hutch plans on accelerating product development after Zillow Group, an online real estate powerhouse, made a $10 million Series A investment. Hutch also has designs to expand and partner with Nordstrom, Target, Urban Outfitters and other major retailers and lifestyle stores to showcase and sell their furniture, giving them access to a new sales channel. It's unclear how the partnership will work, but Hutch would be smart to negotiate a take rate on the sales it generates for its partners and potentially some sort of access membership down the line once it proves it generates heaps of sales. It's a very subtle move to make Hutch a product marketplace. As mentioned above, the future of interior design is going to consist of a lot more technology, efficiency, and virtual reality. Smart homes are already everywhere, with Google Home and Amazon Echo empowering people to interact with their homes by voice, controlling the temperature and lighting. Perhaps one day soon, they can alter furnishings by voice command as well. The Amazon Echo Look knows fashion decently well - it doesn't seem unfathomable to for it to learn interior design and make recommendations for home furnishing purchases, likely generating new sales for the e-commerce titan. Over the last few years, 3D printing has become increasingly efficient and accessible. With the interior design industry undergoing a technological revolution, exploring applications for 3D printing would be a smart move for interior designers and relevant startups. Creating complex models would be vastly simplified, as would sharing custom-made art pieces directly to the client, removing the need for shipping. There is definitely opportunity for an e-commerce platform like Amazon or Jet.com to buy Hutch and take advantage of its unique offerings. 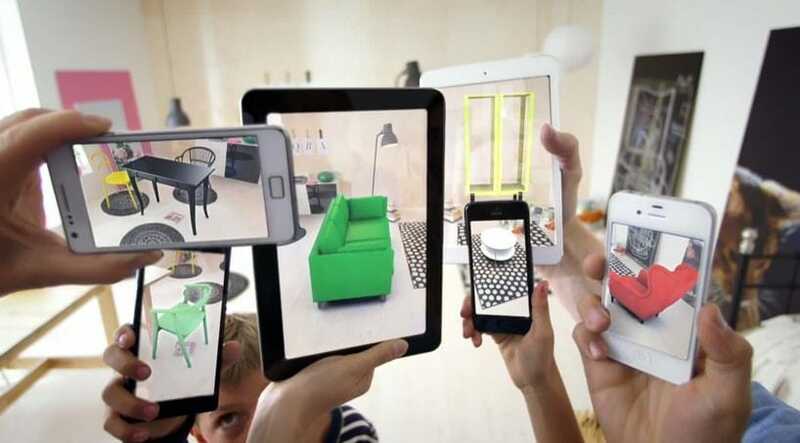 Couching this innovative use of AR could be used to drive new sales. For one, Amazon already sells furniture and it has the cash on hand to buy Hutch outright. An acquisition eliminates the need to invest the capital into building such a complex AR infrastructure. For Hutch, the acquisition would give it the space to grow free of typical startup pressures and access to a lot more resources. Not only would it help Amazon sell its furniture, but buying an app like Hutch also opens up an entirely new possibility. Amazon could incorporate Alexa into the app, capturing new users and enabling them to decorate their homes and make the necessary purchases by voice. Hutch could remain as a standalone, or be incorporated into the core Amazon shopping app. Further, its technology could be applied to other verticals, like fashion. Exciting times are ahead for interior design, thanks to such innovative startups. It's such a shame that storied design firms like Gensler and HKS missed out on such golden opportunities.